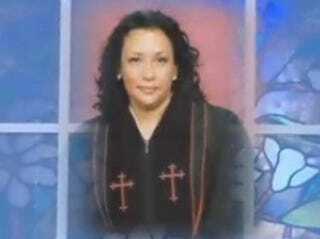 Pastor Sandy McGriff burglarized her friend's home on Christmas Eve. Fresh from our "We Can't Make This Up" file, Black Voices is reporting that Dallas pastor Sandy McGriff burglarized a church member's house, stealing $10,000 worth of furs, purses and electronics. McGriff claims that she didn't break into her friend's home. Instead, she says, she felt the Holy Ghost tell her to stop by Serita Agnew's house on the way to pick up a peach cobbler from a friend. The pastor said that upon her arrival, she saw two men leaving the property and spotted a window that was broken. Instead of calling 911, she climbed through the window and "protected her friend's belongings" in the event that the burglars came back. "I thought I was helping," said McGriff. Uh-huh. Try "helping herself to her friend's belongings," knowing that she wouldn't be home on Christmas Eve. The "good reverend" is blaming the Holy Ghost to boot on Christmas Eve? Can you say, "No shame," followed closely by "sheer and utter foolishness"? If blasphemy were a crime, McGriff, who spent most of Christmas Day in jail, would be sentenced to life. Shaking our heads along with Black Voices over here at The Root.